The Australian government has lately raised the visa application charges for Australian partner visas which has resulted in applicants not being able to afford quality migration advice. This has unfortunately resulted in a spike of refusals for partner visas. The Australian Migration Agent and Immigration Lawyer Association has recognised the issue and introduced a Special Promotion for family stream visas – extending offers for Australian Partner Visa options. If you are married to or in a de facto relationship with an Australian citizen, permanent resident or eligible New Zealand citizen, you might be eligible for an Australian partner visa. A temporary partner visa can also be a pathway to permanent residency in Australia, if your relationship is genuine and ongoing. How much will it cost to use a Migration Agent or Immigration Lawyer for a partner visa application? You’ll never have to pay more than $1,850 for an experienced migration agent to carry you through your partner visa application in Australia! 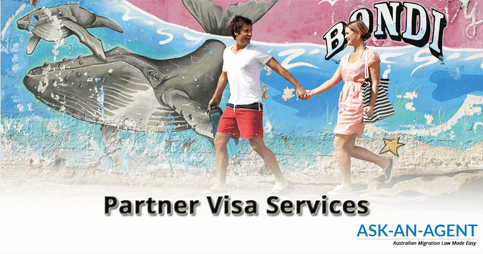 What is a Partner Visa in Australia? Partner Visas in Australia are for husbands and wives, as well as those in committed long-term relationships but aren't legally married, i.e. 'de facto' couples. What is a Prospective Marriage (Fiance) Visa (subclass 300)? This is a partner visa for those who have Australians fiances. It is valid for 9 months, during which time the couple must get legally married in Australia and subsequently apply for an onshore partner visa. What are the conditions for a Partner Visa in Australia? You may be granted an Australian partner visa without having been in a relationship for 12 month if special circumstances apply. Those could for example include having dependent children or that your de facto relationship has been registered in Australia. How do I apply for an Australian Partner Visa? Initially, a temporary visa (2 years) can be granted. This allows you to live, work and study in Australia until a decision is made about your permanent partner visa application. With the temporary visa, you are also eligible to enroll in Medicare. After a period of two years, you can be granted a permanent visa if your relationship is still genuine and ongoing. The two year waiting period can be waived if the relationship with your partner has existed for at least five years or two years if you have any children.